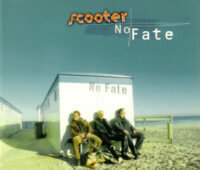 "No Fate" was the final single by Scooter featuring the original line-up of the band (frontman H.P. Baxxter, along with Rick J. Jordan and Ferris Bueller). Ferris, deciding that he had enough of the consistently high-energy life with the band, and also wishing to have a solo career, left in early 1998 to pursue other projects. (It was also later revealed that he had been suffering from depression that he had to to hide in order to maintain the band's positive image.) As the track that effectively ended the band's self-titled "first chapter", it's interesting to note how relatively melancholy this tune is by comparison to their former days of uplifting dance music. "No Fate" was originally a song by Zyon, a supposed "rap" artist produced by the folks behind many popular tracks at the former German publisher Eye Q Records. (Confused yet?) Anyway, this is a cover version of that track, which has subsequently been covered by many other artists since, though Scooter's version has a slightly more high-tempo beat. The Single Mix runs us through the basic paces, featuring H.P. Baxxter speaking the lyrics -- not shouting as per usual! Unlike most of the previous singles, H.P. doesn't sound happy at all, definitely an homage to the sad tone of the original. Bottom line: there's no fate, and nobody is content. Such is life. I do like the C-Part of this song, which is far more danceable and laden with more cymbal crashes than you can shake a stick at; the weird vocal sound effect in the background is pretty sweet, too. Overall, I do enjoy this song; it's an effective cover that does at least some justice to its source material. The Full Length version is basically the extended mix but, as expected, does not offer any new material. And hey, we get remixes as well. Not one, but two courtesy of remix duo R.O.O.S. (who later became more internationally known as Rank 1). R.O.O.S. Mix 1 is pretty derivative of the original, except with cheesier instruments and no vocals. Absolutely nothing to write home about unless you love the bare basics. R.O.O.S. Mix 2 is pretty much the same, except they opted to include H.P. 's vocals. Two generic and instrumentally identical remixes leave me bored. Last but not least, the Trance Mix serves as an instrumental club mix, but without the rockin' C-Part, which is a shame since it's the more club-friendly aspect of the song. I guess it literally IS just the trance part. Scooter's rendition of "No Fate" is certainly worthy of mention, but the sheer absence of variety on this single makes me wonder just how hastily produced it was. The remixes are dull, there's no B-Side, and the other versions provided by Scooter are more or less carbon copies of themselves. It's a nice track, but there's really no need to drill it into our skulls.